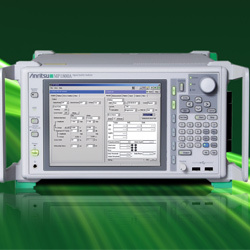 Anritsu Company has recently introduced 28G/32G multi-channel modules for its MP1800A Signal Quality Analyzer (SQA) BERT system that brings unprecedented performance and analysis to engineers designing, developing and evaluating high-speed interconnect interfaces up to 32 Gbit/s. Featuring the ability to synchronize up to 12 Pulse Pattern Generators (PPGs) in a single mainframe, along with best-in-class intrinsic jitter and excellent input sensitivity, the MP1800A is well suited for DP-QPSK 100G long haul applications where four synchronized PPGs with precise skew control are required, as well as to accurately measure jitter tolerance and X-talk on high-speed backplanes and interconnects. The MP1800A SQA is a modular BERT that combines a built-in PPG that supports output of high-quality, high-amplitude signals; an Error Detector (ED) with high input sensitivity supporting signal analysis, such as bath tub and Q measurements; and a Jitter Modulation Source for generating various jitters, such as SJ/RJ/BUJ/SSC, and supporting jitter tolerance tests. Combining the MP1800A with the 28G/32G PPG module (MU183020A, MU183021A) and 28G/32G ED module (MU183040A, MU183041A) allows the BERT to support signal integrity analysis up to 32 Gbit/s for various applications. In addition to 100 GbE, the new configuration can analyze OTU-4, 32G DP-QPSK, CEI-28G, 32G Fibre Channel, and Infiniband EDR designs. The MU183020A 28G/32G PPG supports output for one or two channels, while the MU183021A supports simultaneous output for four channels. Each output channel supports data pattern synchronization and individual delay setting for high-accuracy crosstalk evaluation when transmitting　multi-channels. The PPG outputs 3.5-Vpp max. high-quality waveforms – larger than comparable systems, with an option for supporting direct driving of high-amplitude devices, for more detailed analysis capability. The MU183040A 28G/32G ED supports one or two measurement channels, while the MU183041A supports simultaneous input for four channels. Featuring high input sensitivity that is 2x better than other solutions, the ED offers direct measurement of 50-mVpp data signals. For evaluating PCB characteristics, such as high-performance server backplanes, the MP1800A can be integrated with the MP1825B 4Tap Emphasis, which adds four taps to PPG signals up to 28.1 Gbit/s, for various pre- and post-cursors. The MP1825B control software reduces design times by supporting a built-in emphasis optimization function to automatically calculate the ideal emphasis setting based on S21 parameters measured by a vector network analyzer, such as Anritsu’s VectorStar®, or generated with a simulator.